It’s a logical way to express the emotions you feel for Star Trek! 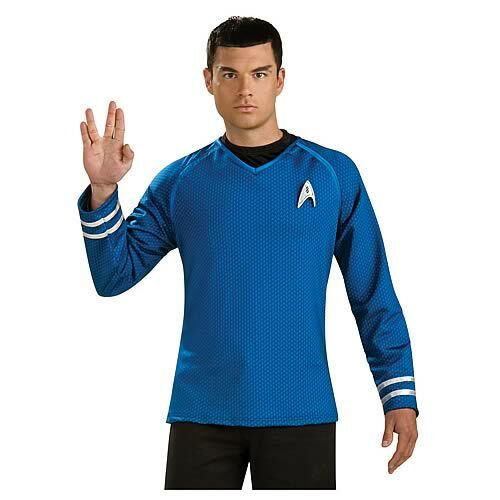 I had many problems with the JJ Star Trek movies, but the uniforms were something that they got RIGHT. They had that nice pattern on them and fit all the actors very very well. Also, there’s a yellow captain’s version as well. Sideshow Collectibles is proud to present the U.S.S. Enterprise Metal-Plated Phaser Replica by Quantum Mechanix. Got pesky Romulans lurking in the shadows? Or Klingons off the starboard bow? All you need to ward them off is this gleaming 1:1 scale, screen-accurate replica of the stunt phaser used in J.J. Abrams’ Star Trek. This phaser replica has been cast from a first-generation master of the screen-used phaser. Its solid polystone core is precision metal-plated in several finishes – steel, gunmetal, aluminum block and chrome – to create an exact match of the actual hero phaser used in the movie. 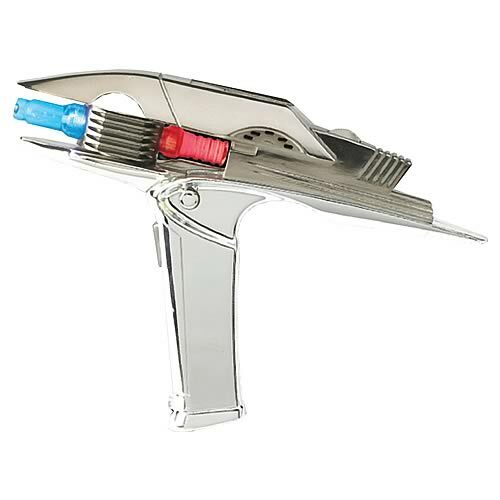 The QMx Enterprise Metal-Plated Phaser Replica measures 10.5″ long x 7″ high (grip included) and weighs more than one pound. It comes with a custom-designed display stand in smoke-colored lucite and includes a brass name plaque. via Sideshow Collectibles, Inc. – Metal-Plated 1:1 Scale Phaser / Prop Replica. * Is this cool, or what?! * Electronic tricorder just like in the 2009 Star Trek movie! * Realistic prop replica of the instrument seen in the film. * Spring-loaded top and front-door covers! This very cool Star Trek Movie Electronic Tricorder is a replica of the instrument seen in the film. It has a spring-loaded top and front-door covers, lights up, and makes genuine Star Trek movie sounds. If you see a trip aboard the Enterprise in your future, you just might want to take one of these along! * Get your hands on this electronic phaser! * It’s a realistic space-gun from the 2009 Star Trek movie. * Authentic lights and sounds! Stun or kill? It’s your call! This slick Electronic Starfleet Phaser is constructed of vacuum-metalized plastic and makes authentic Star Trek movie sounds when the trigger is pressed. The weapon’s barrel pivots horizontally to switch from stun to kill, with each setting having its own lights and sounds. Bet you can’t wait to get your hands on one of these! 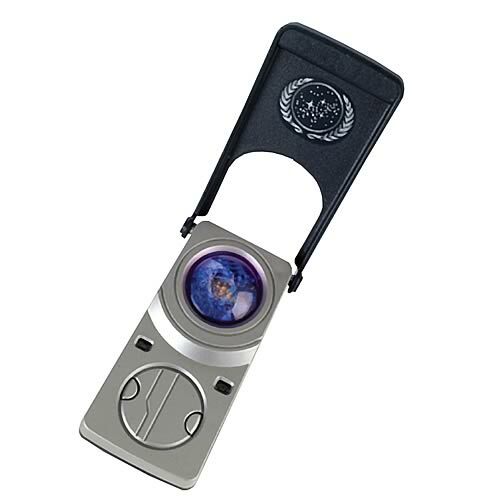 This is a great companion piece to the Star Trek Movie Electronic Communicator (sold separately). * Communicate with the future! * Based on the 2009 Star Trek movie. * Flip-open cover, lights, character voices, and sound affects from the film. * You need this in your kit! Communicate with the future! 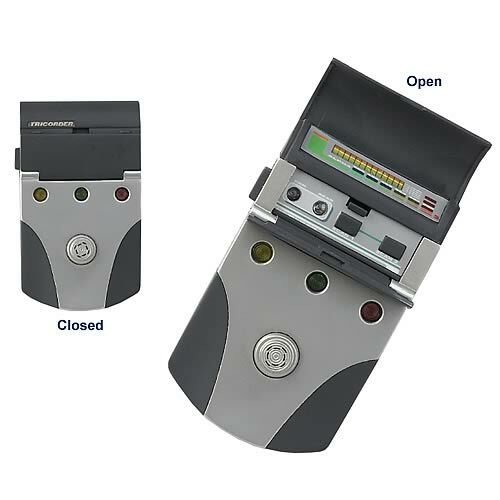 Based on the 2009 Star Trek film, the Electronic Communicator includes details of the one used in the movie. The cover flips open manually to reveal a lenticular label of Kirk and Spock. The device also lights up and features authentic character voices and sound affects from the film. Two buttons activate different sequences of sounds and lights. The future is now with this awesome item in your kit! This is a great companion piece to the Star Trek Movie Electronic Phaser (sold separately). 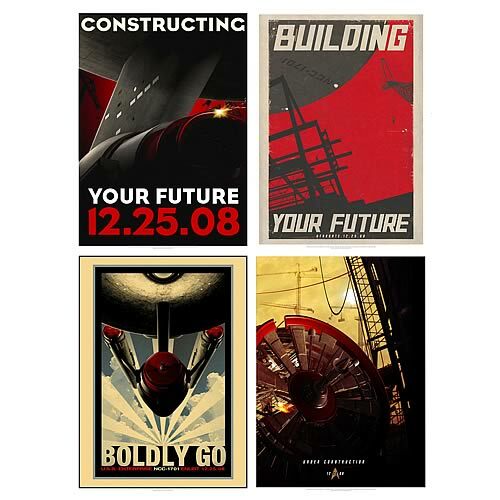 This fall, get Star Trek posters that make you feel like you’re off to an amazing new future! The Star Trek Movie Retro Poster Series 1 Set includes 4 new posters with some of the best artwork we’ve seen on a print of this nature. Check out the awesome lines and curves, the spectacular use of color, and the very nice price point– after all, you get all 4 posters in this terrific set! Ah, some high quality Star Trek Badges! I had had not realized that they changed all the badges on everyone’s chest. via Qmx Announces New Star Trek Movie Badge Replicas | TrekMovie.com. 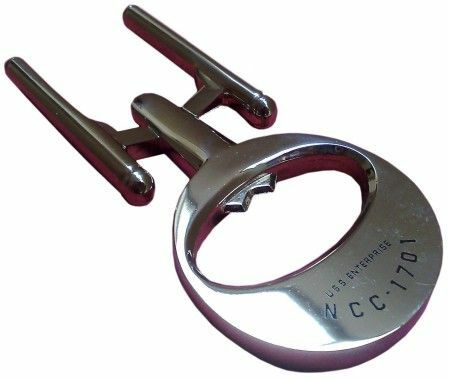 This sturdy Starship Enterprise bottle opener is perfect for those times when you’re compelled to boldly go to the fridge! via Star Trek: Starship Enterprise Bottle Opener @ Forbidden Planet. The basic set contains 81 cards, each with an image on the front and some text on the back. The secretive nature of the film limits the text somewhat on the back to generic descriptions, yet the set is attractive and the pictures are very nice. One of the fun aspects of trading cards is getting to see either unusual images or deleted scenes. Rittenhouse doesnâ€™t disappoint here. For example, there is a card featuring JJ Abramâ€™s father who has a cameo in the bar scene (he is one of the older patrons watching the fight between Kirk and Cupcake). There are also cards of deleted scenes from Vulcan. What is nice is that the set doesnâ€™t just give images of Kirk and Spock, yet the entire cast is represented, from elder Spock to Nero. Now Trekkers can boldly walk in footwear like no one has ever seen before. CBS Consumer Products, a unit of CBS Entertainment, announced today that acclaimed street style designer jeffstaple, whose fashions have been sported by the likes of Mos Def, Questlove, Lupe Fiasco and John Mayer, has unveiled an exclusive Star Trek inspired high-top sneaker dubbed Terrain “Enterprise Edition.” The limited edition Airwalk sneaker will be exclusively available at jeffstaple’s retail shop Reed Space located in the trendy shopping district of SoHo in New York City. The shoes will be available for order through the retailer at 212-253-0588 for $80 per adult pair/$60 per kids pair.